This is an unique dosing reminder with pill box. The material of box is PP with FDA grade. 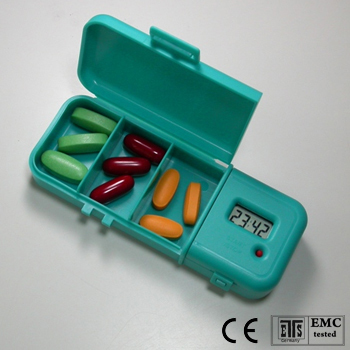 There are three compartments in the box for pills storage. The case is sized as 120 x 45 x 23 mm, good to put in pocket. The three buttons of medication reminder are covered to avoid any accident depress of them. However, the cover is opened a hole at the position of confirm button, so that user can depress the button without open the cover. Therefore the medication reminder is very conveniently for user to confirm the dose is taken. Our company offers dosing reminder and medication alarm clock with high quality and reasonable price. If you are interested in our medication reminder, welcome contact with us. We thank you for your time. Unique alert method: when set time is up, beeping for 3 times, then wait for one minute and repeat beeping until the "MODE" button is depressed.